In addition to 3D buildings and terrain views, Uconnect 8.4N with integrated Garmin navigation features road signs and lane guidance that covers more than 60,000 intersections across the United States. Information is very realistic and intuitive, enabling drivers to keep their hands on the wheel and focus on the road. There have been plenty of headlines recently regarding the performance across the Dodge lineup, and with the improvements to the 2014 Dodge Charger SXT Blacktop, let the clippings continue! Delivering more power and performance is a 300 horsepower, 3.6-liter Pentastar V-6 engine featuring a cold-air induction system and sport-tuned dual-exhaust system with an enthusiast-desired sound. In addition, the segment-exclusive, eight-speed automatic transmission is upgraded with steering wheel-mounted paddle shifters and “Sport Mode.” With Sport Mode, gear changes are quicker and revs are held higher for even more performance-oriented acceleration and higher shift dynamics. For even more control, the driver can also use the die-cast steering wheel-mounted paddle shifters and view gear selection through the full-color Electronic Vehicle Information Center (EVIC) centered in the Dodge Charger’s instrument cluster. 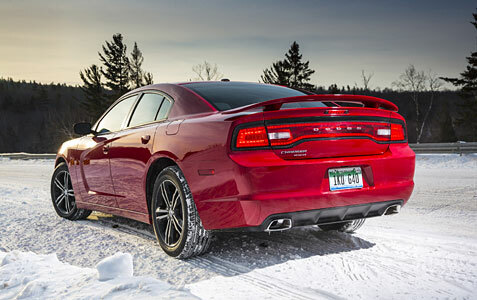 As the first domestic sport sedan to feature an eight-speed automatic transmission, the 2014 Dodge Charger with the award-winning 3.6-liter Pentastar V-6 engine delivers best-in-class fuel economy in rear-wheel-drive at up to 31 miles per gallon (mpg). Once limited to premium import vehicles costing twice as much, the segment-exclusive eight-speed automatic transmission expands the world-class power and fuel efficiency of the Dodge Charger SXT Blacktop. This superb growl from the 300 horsepower engine is just an added bonus to an exciting car that’s fun to drive. The Dodge Charger has achieved five-star safety ratings from the National Highway Traffic Safety Administration (NHTSA). The five-star rating is the highest rating for safety by the Administration and measures vehicle safety performance in three categories, including front, side crashes and rollover crashes. 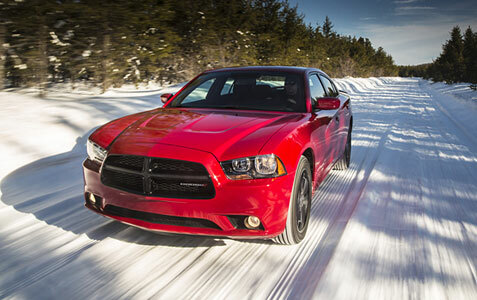 The Dodge Charger achieved an overall five-star vehicle safety score. The rating is a combination of frontal, side pole and barrier performance with the static stability factor accounting for the rollover rating. It also achieved high marks in rollover testing with a four-star rating. People will buy the 2014 Dodge Charger SXT Blacktop for looks alone, but there is so much more here that will satisfy buyers even more than the appealing design. The 2014 Dodge Charger provides the ultimate combination of dramatic Dodge heritage styling, award-winning premium interiors, the reassurance of an Insurance Institute for Highway Safety (IIHS) “Top Safety Pick,” full-size spaciousness with best-in-class V-6 fuel efficiency, and world-class handling and performance. Our crazy-loaded test model came in at a modest $40,735, which garners attention that some cars twice the price can only dream about!